Earlier this year Acer released the best gaming monitor on the planet, the first 144Hz model to use a beautiful IPS screen. The 27-inch, 2560x1440 G-Sync monitor replaced the Asus RoG Swift as our favorite thanks to its superior IPS screen. Well, Asus has finally fired back, releasing the anticipated PG279Q that we first saw at Computex in June with an IPS screen and up to 165Hz refresh. How do they compare? TFT Central has performed an extensive review of the new monitor, and we’ve pulled out some of the highlights. The PG279Q still has the 27-inch display with a 2560x1440 resolution, with a response time of 4ms. 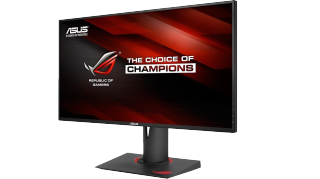 It also has a refresh rate of 144Hz which is overclockable up to 165Hz. It has a DisplayPort 1.2a, and a 1.4 HDMI port, as well as two USB 3.0 ports. Aesthetically, the PG279Q is pretty much the same as the PG278Q RoG Swift, with a “frameless” design that only gives you a total frame border of 10mm. TFT Central says the base is sturdy, and it has a pretty circular light around the stand connection as well as a lit up ROG Swift logo off to the side. From all sides the PG279Q looks thin, and stylish. The on-screen display menu includes a “GamePlus” quick access menu, which has options for cross-hairs, a timer, and a frames per second counter. The OSD also features an option to turn on overclocking. In addition, there’s a Turbo button to allow you to switch between 60, 120, and 144Hz refresh rates, or whatever you’ve overclocked it to. However you will need an Nvidia GTX960 or better to actually use overclocking. The calibration performance tests came out with a 2.3 default average gamma, (4 percent deviance from 2.2) a default white point of 6206k (5 percent deviance from 6500k). Pretty good when compared with the competing Acer XB270HU which has a deviance of 9 percent and 6 percent respectively. It also has a better default DeltaE average of 1.1 compared to the XB270HU’s 1.9. They each have the same calibrated black depth of 0.12cd/m^2, and a very similar calibrated DeltaE average, with 0.3 for the Asus monitor, and 0.4 for the Acer. As for calibrated contrast ratio, the Asus has 989:1, while the Acer has 1000:1. Thanks to the IPS panel, the viewing angles of the PG279Q were good, with minimal color tone shift until you get past about a 45 degree angle. Only a slight darkening occurs horizontally from wider angles, with contrast shifts occurring more noticeably in the vertical field. The PG279Q has a similar level of “IPS-glow” to the Acer XB270HU when looking at a black image, which is mostly inherent to the technology. As for gaming, the PG279Q offers G-Sync and has a ULMB blur-reduction backlight system. However the two can’t be used in conjunction since ULMB won’t work with G-Sync’s variable refresh rate. At the moment, Nvidia’s 3D Vision is not supported, so you’ll be better off sticking with the PG278Q if you’re looking at using 3D. TFT Central tested input lag, and the screen only showed a total lag of 3.25ms, the majority of which can be put down to pixel response times. So the conclusion is that the monitor should be fine for all gaming. Up at 144Hz, the response time gets as low as 5.2ms, which is faster than the Acer XB270HU which had an average of 5.9ms at 144Hz. These results were found using the monitor’s Overdrive mode. When OD was turned off, the response times were much slower, and there was more blurring on moving images. When overclocked, the PG279Q didn’t drop any frames at its maximum 165Hz refresh rate, however the response times at the higher refresh rate were not as good as they were at 144Hz (6.0ms). That means it'll likely be better to stick to 144Hz rather than overclock for gaming, but limiting one of the few features Asus has over its Acer competitor. The Asus PG279Q is definitely a contender for the new best gaming monitor, but the two displays are clearly so similar, you can't really go wrong with either one.